Greg Pipes was a two time Southwest conference All-Star and an All-American in his senior year at Baylor in 1967. Pipes was drafted in the 12th round by the Buffalo Bills, but was talked into comng to Canada to play by Edmonton coach Neill Armstrong. 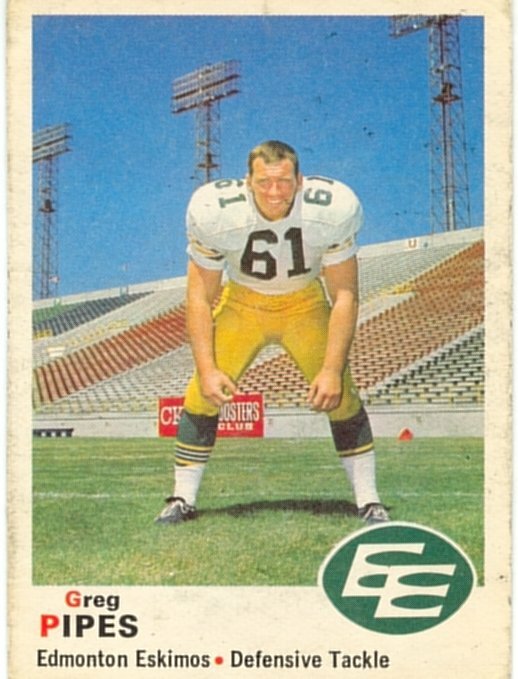 Pipes played five years in the CFL with Edmonton from 1968 to 1972. Pipes was a top notch defensive tackle, winning West and CFL All-Stars in 1970. Following his career in the CFL, Pipes returned to Baylor and earned his law degree which led to a 35 year career as an assistant District Attorney. Pipes was named a Baylor legend in 2009. No defensive tackle or quarterback sack stats were kept during these years.